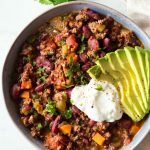 Serve a big crowd or meal prep ahead in just 45 minutes with this amazingly delicious Instant Pot Chili. 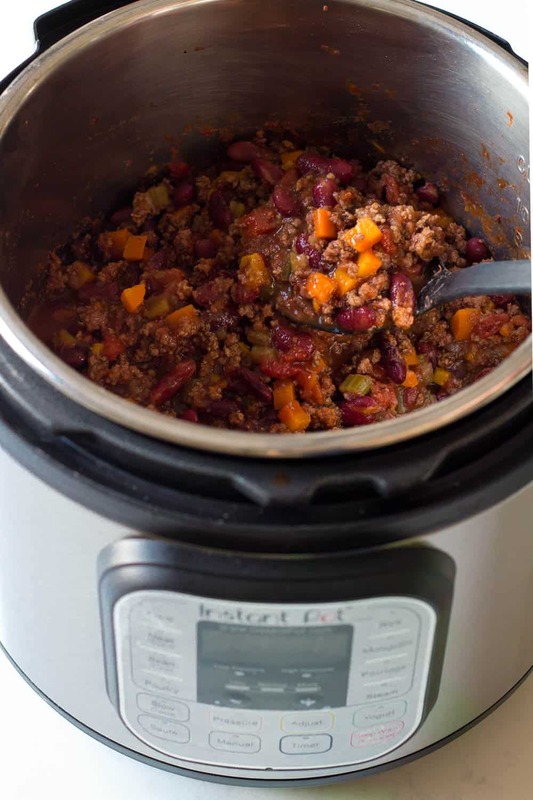 A quick, easy, nourishing and inexpensive pressure cooker chili recipe that makes everybody happy! You won’t believe it but Chili is a popular “crowd meal” in Germany. Yes! In Germany! I was born and raised in Germany and I’ve eaten Chili Con Carne at several birthday parties, street festivals and big family get togethers. For those who didn’t know. Chili is a staple of Tex-Mex cuisine. It is not as many believe a typically Mexican dish. It originates in the US and is Texas’ official dish. There are different variations of this famous dish. Some with beans, some without. Some with tomatoes, some without … The one thing most of the different chilis have in common is that their main ingredients are ground beef and of course chili powder. My recipe is fairly “classic” if one can say that about a recipe. Ground beef, kidney beans, diced tomatoes, chili and cumin. However, my version has two interesting twists. One is that I added tons of veggies so it fits the Green Healthy Cooking crowd. And two, I made it in my Instant Pot to speed up the process. 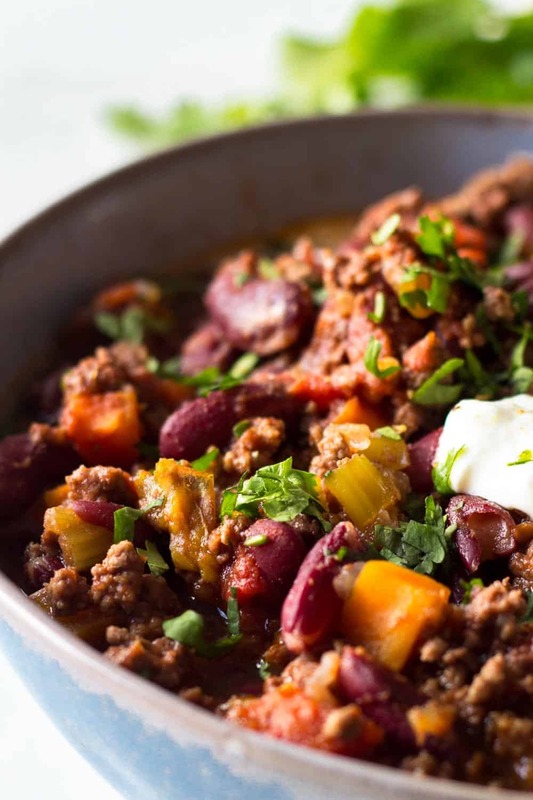 Hence it’s name: Instant Pot Chili. Pressure cookers are such a wonderful thing when it comes to dishes that usually need 10,000 hours of simmering. They do the job in NO TIME! It’s the perfect dish for either a crowd or to freeze half of for those busy nights you know you will not be able to cook. 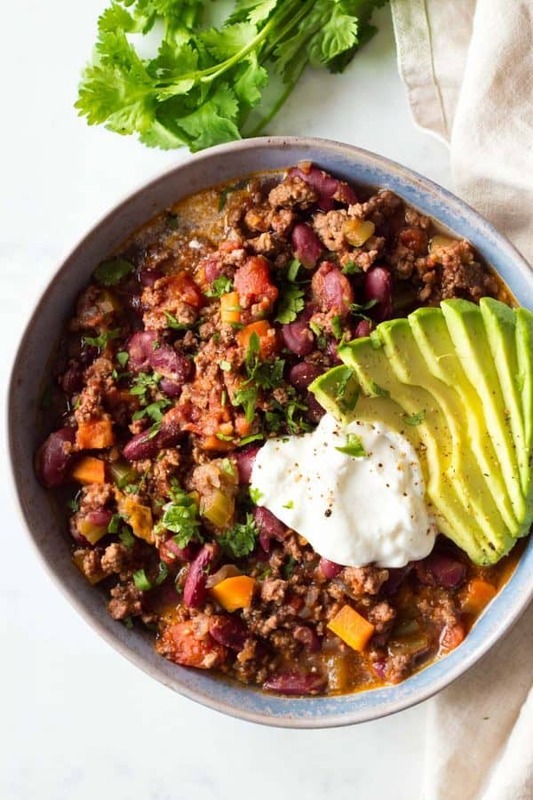 Spend 10-15 minutes prepping, set your Instant Pot and off you go relax with your guests while the Chili cooks itself in a mere 25 minutes! I recommend putting your dried beans in a big pot, cover them with water and let soak on the kitchen counter for about 12 hours. Before adding to the instant pot, drain and rinse and they are ready to go. It’s a step you have to remember the night before but an easy and super duper quick step! 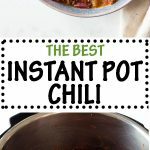 How long does it take for Instant Pot Chili to be ready? The instant pot takes anywhere from 8-12 minutes to get to pressure, plus 25 minutes cooking time at high pressure makes 33 minutes total. Add about 2-3 minutes for the pot to get hot for sautéing, 7-10 minutes to brown the meat in batches, 3-4 minutes for the onions and garlic to become translucent, 1 minute to dump the rest of the ingredients into the pressure cooker and you’re at 45 minutes total. The veggie chopping can be done while waiting for the instant pot to get hot for sautéing and while waiting for the onions to become translucent. If you are a slow chopper I recommend chopping the veggies ahead of time. First of all you need some toppings to make it EXTRA delicious! Avocado, a dollop of sour cream or yogurt, chopped fresh cilantro and a couple squeezes of lime juice if you like. My favorite side for it is rice and ever since I have my instant pot I exclusively make Instant Pot Rice. I couldn’t be more in love with this awesome machine!!! The night before put kidney beans in a large bowl and cover with abundant water, they will inflate to double the size, make sure they have enough water to always be soaking. The next day, drain and rinse beans really well. Peel and chop onion, peel and crush garlic, wash and dice all vegetables. Preheat the instant pot by pressing sauté. Once it says "hot", add a little frying oil and brown the ground beef in 3-4 batches by constantly breaking it up and moving around to avoid from sticking to the bottom. Once you finished browning the last batch, add a little more oil and fry chopped onions and crushed garlic until translucent. Add all ingredients to the instant pot and give them a good stir. Put on the lid and turn the knob to the sealing position. Press "manual" (or "pressure cooking" in newer models"), make sure to select "high pressure" and adjust the timing to 25 minutes. Once Instant Pot beeps, manually release pressure and open the pot once the pin drops. Serve alone or over rice topped with sliced avocado, a dollop of sour cream, chopped cilantro and if you like, a squeeze of lime juice. I was wondering if you drained the fat as you cooked the beef? I used lean beef, so I didn’t. When using regular ground beef I would. Not so much because of fear of eating fat but rather to make the chili more flavorful. Excess fat dilutes the flavor. After seeing so many of Lorena’s instant pot recipes, I recently bought one! YAY. So far, I am experimenting, learning and loving those experiments that come out right :) Yesterday I made the chili and it was FABULOUS. Absolute hit with everyone at the dinner table. I did increase the amounts of chili and added chipotle peppers as we like our chili hot. Hello! I’m looking to start trying out the instant out and this recipe sounds great! I was just wondering for the canned diced tomatoes if you drain it or add the juices in as well? Can’t wait to try, thanks! Hi Sonia, I’m happy you chose one of my recipes to try out your Instant Pot :D I add the whole can with juices and all. Hi! How do you calculate the Nutrition Facts? Hi Svilen, I use a plugin called WP Recipe Maker. Please only take it as a guide. I’m not a nutritionist, so I cannot provide 100% accurate nutritional information. Hi, I want to attempt this recipe soon but how would you recommend to store it? How long does it last before it goes bad in the refrigerator? I’m so happy you liked it Lisa :D Thank you for coming back and commenting and rating. I really appreciate it! Do you have an 8qt? I don’t want my chili to burn if I don’t put in enough thin liquid. Thanks! If I’m cutting this recipe in half do I need to reduce the cook time or leave it the same? What could you use instead of avocado oil? TIA! I tried it today and did not like the result. The meal was almost tasteless, the ground beef had become fine as sand. This could have happened because of the strange imperial measurements given in the recipe: I changed the number of people to 6 and the result was “3/20 cup of water”. What is that supposed to mean: 1/6 of a cup of how many millilitres? I used almost a full cup thinking that 40 or so millilitres would have been expressed in tablespoons, and that might have spoiled it. Also, when I made chili con carne in a frying pan a couple years ago, I made sure to well-brown the meat first before stewing it, so that it would retain its coarse texture. Why not do it here as well? This chili was a success. It was easy to make, didn’t take long. Our neighbours even had a bit to taste at camp (as we only had a little leftovers) and they all said it was great. Therefore, this recipe will go into our repertoire. Thanks.